Do you want a $20,000 raise? 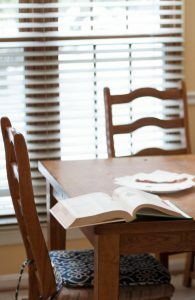 Learn to use your kitchen table as a financial power tool. My table saves us money. You can have one too. Chairs are optional but encouraged. Here is how you use a table to save money; if you eat out at a restaurant get it to go and eat at the table you have at home. That will save you 15-20% on the tip. Ideally you should eat at home most of the time but if you don’t this simple technique saves time and money. Let’s take a look at the numbers. Assume you tip 20% and eat out as a family, three times a week for a total expense of $150 a week. 20% of that cost – or $30 dollars – is spent on the tip. Skip that and in a month you will save $120 while eating the exact same food. In a year that is $1,440 not spent. And you don’t have to wait for the check. In ten years you will have saved $14,440 in expenses which would have cost over $20,000 in income before taxes to pay for during that time. All that from thinking differently about your kitchen table. Keep reading to collect ten of these money saving techniques and suddenly paying for private school might not seem as daunting.